A prison letter from Ibrahim Halawa has detailed the torture he faces on a daily basis. Fatima, Ibrahim's sister, campaigning for his release. IMPRISONED DUBLIN STUDENT Ibrahim Halawa has claimed that he has been beaten with AK47s during his near three years in an Egyptian jail. In a prison letter responding to questions from The Times and human rights organisation Reprieve, Halawa answers a his brutal treatment also describes being forced to watch the torture of other prisoners. “There are many ways I have been mistreated: cursing, beatings, solitary confinement, ‘the tank’, convicts and the sweeper, head shaving, hunger strike, stripped, [beaten with] the back of an AK47, guns pointed at my chest, sleeping on the ground, robbery, and many more,” he writes. As I go along I will explain each one. Cursing is the least [serious] and [the most] normal. They curse your father and mother. If you object it turns into a beating. Beating is a general title. I have been beaten with a plastic plumbing bar, slapped, punched, kicked, and dragged. You can have all of that happen to you for just one reason: speaking while an officer is speaking. Hawala has now been held a total of 1,030 days without trial after being arrested during a demonstration in Cairo in support of the Muslim Brotherhood. The Muslim Brotherhood had been ousted from power by the Egyptian military after winning both parliamentary and presidential elections. In the sweeper, you are made to lay on your stomach with a stick in the center of your back. Your arms and legs are dragged back and tied to the stick and they make a convict move the stick up and down.Shaving the head is more of a mental treatment. They shave your head but leave patches of hair so you feel mentally distressed. They also strip you naked and leave you for everyone to look at you.They torture another prisoner and they make you watch. They bury him in garbage and he isn’t allowed to move. Crucify men. They hold a man’s arm against the curb and you hear it break when they kick it.A man is tied to a tree with honey all over him for insects to gather on him. A man is hung from a basketball hoop by his handcuffs and beaten while hanging in the air. And a lot more. Almost 500 others were arrested along with Halawa and the Egyptian courts have been attempting to try them in a mass trial. The chaotic process has seen his trial postponed a total of 13 times. In the letter, Halawa also describes the scene each time he appears in court and being beaten before he gets there. You can’t speak to the judge. He only spoke to one brotherhood leader. If every lawyer wants to speak about his defendant we will never finish the trial. It’s not up to the judge, it is up to Homeland Security to postpone or release or sentence. If you decide to not go to court, you’ll be beaten and brought by force. Halawa was also asked about why he attended the Cairo protest. He says he was not a supporter of Mohamed Morsi, the Muslim Brotherhood’s elected president, but supported the right of the Egyptian people to choose their leader. I spoke freely, protested peacefully, and was arrested violently. I was shot with a shotgun and with tear gas. I’m not pro-Morsi. I’m pro-democracy. If I’m convicted, I won’t be the first who has taken this road and been convicted. Even the great hero Nelson Mandela was convicted. 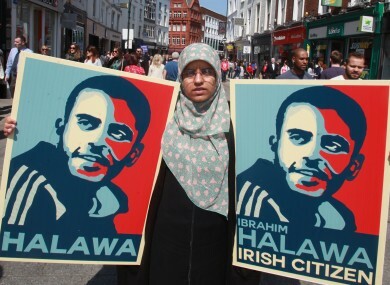 In a statement on Halawa’s letter today, the Irish government has said that it has two objectives: to ensure that Halawa is freed and to provide all possible consular support while he is prison. As would be the case for any Irish citizen imprisoned abroad, any suggestion of ill-treatment in this case would be treated with the utmost seriousness by the Department of Foreign Affairs and Trade and would be raised urgently with the Egyptian authorities. Ibrahim has been visited on over 50 occasions by Embassy officials and this very high level of consular visitation is an important practical tool in monitoring our citizen’s welfare and ensuring that the Embassy in Cairo is well placed to raise any concerns arising directly with the prison authorities. The most recent consular visit to Halawa was made by ambassador Damien Cole last Sunday. Sinn Féin MEP Lynn Boylan has called for the government to end its “softly, softly” approach to dealing with the Egyptian government. While I believe Ibrahim’s situation has clearly deteriorated, it should be noted that some of the abuses now being referred to were described to me when I visited Ibrahim in prison and I relayed my concerns back to the Department of Foreign Affairs at that time. I also referred to the need for Ibrahim to be examined by an independent doctor but that never happened. I reiterate that call today. Both the EU and the UN have called for an end to Halawa’s detention in the continued absence of due process. Another date for the beginning of his trial is scheduled for 26 June. Email “"They hold a man’s arm against the curb and you hear it break when they kick it."”. Feedback on “"They hold a man’s arm against the curb and you hear it break when they kick it. "”.